Being a former sun worshiper ( notice I say “former” ), I know how pleasurable it is to luxuriate in the sun and damn the consequences! Life is for living and enjoyment, right? Well, yes, but then you get home, the tan fades and you’re left with dried out, pigmented and older looking skin. But don’t despair, if your skin is suffering from post summer malaise and needs to be rejuvenated, there are things you can do. Here Shabir Daya, pharmacist at Victoria Health, tells us about an amazing product that not only protects but also helps heal sun damaged skin. It can even be used after your holiday as it’ll help enhance collagen production. He also talks about the super antioxidant, Astaxanthin, a true anti-ageing collagen building supplement. I’ve recently added this to my regime as it’s a must for anyone wanting to maximise the health of their skin. Moderate sun exposure not only makes you look and feel good, but it also helps encourage the production of vitamin D3, which is crucial for hundreds of processes within our bodies. However, many people simply over expose themselves to the sun resulting in dry, dehydrated and prematurely aged sagging skin which is simply not a healthy look. It is really obvious that if you are going to expose yourself to the sun’s rays, then you do need to use a high protection sun cream and to re-apply as frequently as necessary. Research into skin and suncare products has been growing exponentially over the last decade and there are some very good suncare products on the market. 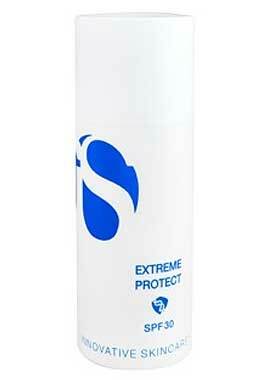 My favourite, and certainly the most advanced sunscreen I know of, is Extreme Protect SPF 30 by Innovative Skincare. Extreme Protect encompasses the very latest in research and utilises very specific enzymes that have been shown to survive extreme temperatures and conditions. These enzymes, called Extremozyme, give help to the skin, its cells, our genetic material and of course all the compounds found within the cells. Extreme Protect SPF30 works to provide multiple levels of protection against UVA and UVB radiation containing a physical sunscreen, zinc oxide, as well as a chemical sunscreen. But Extreme Protect SPF 30′s benefits do not just lie in its ability to protect against the ageing sun’s rays. It goes beyond simply protecting skin and actually helps to repair and re-build skin. Its unique formula contains potent antioxidants including Olive Leaf extract, Vitamin E and Centella Asiatica. Olive Leaf and Vitamin E protect our DNA and collagen from free radical damage due to sun exposure whilst Centella Asiatica has been studied extensively for its ability to enhance collagen manufacture, which is absolutely essential for sun damaged skin. As far as supplementation goes, Astaxanthin is a powerful antioxidant known to be hundreds of times more effective than many other antioxidant vitamins and minerals and this antioxidant has been proven to significantly enhance collagen production within skin. A study carried out in Canada involving women between the ages of 35 and 55 showed improvements in fine lines, an increase in dermis density of up to 78%, and visible improvement in the skin’s overall appearance. As long as you consistently use Extreme Protect SPF30 and a good astaxanthin supplement, you will see the benefits. How long this takes all depends upon the extent of the damage. The results will certainly not be overnight so patience is key when trying to repair sun damaged skin, but we highly recommend this regimen and you can of course use Extreme Protect as a skin treatment prior to make-up, which will give you a rather magnificent radiance and glow, which is attributed to the micronized encapsulated zinc in the formulation. Can you use Extreme Protect before sunbathing as well as after. Thanks. Yes you can use as a moisturiser. I use for most of the summer.